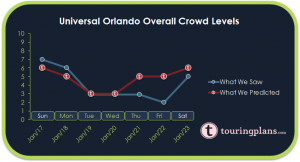 How Crowded Was Universal Orlando Last Week? Cool weather on Thursday and Friday kept the Universal Orlando parks at near-empty levels. 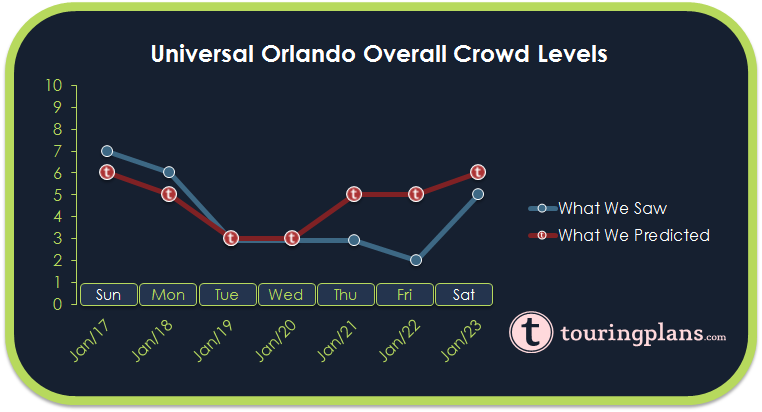 Otherwise, the Universal Crowd Calendar did a great job predicting the flow of crowds last week from day to day. If anything, crowds were slightly higher than expected in the early part of the week and slightly less crowded than normal for the second part. Late January is off-season for Universal Orlando so we can expect crowds to be in the lower half of the crowd scale for most days as we saw last week. Universal Studios was more crowded than Islands of Adventure on Sunday (in fact, it was the more crowded park all week). There we saw average wait times like 57 minutes at Hollywood Rip Ride Rockit while Dragon Challenge was 25 minutes. Universal Studios led the way with crowds again on Monday. Wait times were 10 to 12 minutes higher on average compared to what we saw at Islands of Adventure. Tuesday brought the lowest crowds of the week so far. The Universal Crowd Calendar correctly predicted the crowd level at both Universal parks. Wednesday’s crowds were the same as what we saw on Tuesday. Revenge of the Mummy averaged 13 minutes (predicted 14) and Hollywood Rip Ride Rockit averaged 30 minutes (predicted 33). More ‘4’s and ‘2’s on Thursday, which was the third day in a row. The Universal Crowd Calendar expected a point or two higher but cool central Florida weather kept the crowds lower than expected during the second half of the week. Normally by Friday we would see the Universal parks start to get busier but last week the cool weather kept the parks near empty on Friday, especially at Islands of Adventure. Harry Potter and the Forbidden Journey only averaged 19 minutes. Saturday’s crowd level ‘3’ at Islands of Adventure means that park went the entire week without getting a crowd level above ‘5’. Universal Studios was much busier than its sister park with average wait times like 35 minutes at The Simpsons Ride and 33 minutes at Men In Black. Late January and early February are off-season for Universal Orlando and guests visiting the parks this week and next will likely see manageable parks. Cold weather tends to keep the locals from visiting the parks so if you are from out of town on vacation, bundle up and hit the parks. The lower crowd levels make up for the chill in the air. To see Universal Orlando Resort Crowd predictions for the days of your vacation, check the Crowd Calendar.